Yesterday, Diana Gabaldon was in Ottawa to promote her latest book in the Outlander series, Written in my Own Heart’s Blood. I arrived 2 hours early at Chapters Rideau for the event, and was surprised to see that about 100 people were already waiting. So I quickly grabbed a seat. Of course, I came prepared: I brought a snack, bottled water and my ipad. I had all I needed to while the time away. The wait was definitely worth it though! The event started right on time: Catherine-Ann MacPhee and a Gaelic choir came on stage to perform a lovely Scottish song. It set the mood for the occasion. Then Diana Gabaldon proceeded to tell us how she became a writer. When she was 8 years old, she already wanted to be an author. Later on, her parents encouraged her to go to university, and she earned 3 degrees in Zoology, Marine Biology and Quantitative Behavioral Ecology. Afterwards, she was a university professor for a dozen years. But when she was 35 years old, she decided it was time for her to go back to her first love: writing. She was ready to write her first novel. She didn’t tell anybody though, not even her husband. She kept her day job, continued to care for her 3 children, and spent part of the night writing. She chose historical fiction because she was used to doing research, and thought that if she ran out of ideas, she could borrow plot lines from historical records. Then she saw a “Doctor Who” episode where a Scotsman named Jamie appeared in a kilt, and she decided to base one of her main characters on this fetching man. In addition, she set her novel in eighteenth century Scotland because she thought that the period was interesting with the conflict between the English and the Scots. Next, she believed she needed to throw a woman among all these men to make the story even more compelling. So she created Claire, but it turned out the character had a mind of her own, and she refused to speak the way she should have for the period. In fact, Claire was a very modern woman. Diana Gabaldon thought time-travel could be a solution to this dilemma. Since World War II nurses were very courageous and sassy women, they were the perfect inspiration for Claire. The author then started writing her story. After a while, she decided to share some of her writing online on Compuserve, and she got some feedback from other writers. Even though she hadn’t finished writing her first draft, she contacted an agent, and sent him some excerpts. To her surprise, he took her on, and when 6 months later, the manuscript was ready, he sent it to several editors. 3 of them were interested, and a bidding war ensued. Diana finally told her husband of her secret project, then she phoned her father who congratulated her, but told her not to quit her day job (her mother passed away when Diana was 19). 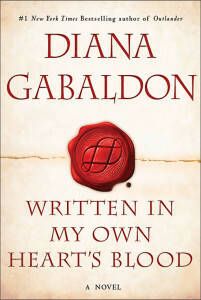 And this is the story of how Diana Gabaldon became a writer. Of course, the author related this much better than I did, but I think this is a pretty accurate summary of it. After the author talked, the Gaelic choir came back to perform a few songs, and then there was a Q&A. That’s when Diana Gabaldon told us about the new Showcase series “Outlander” that will air starting Aug. 14. She thinks that the crew did a fantastic job, and she loves the cast. She consulted on set, but she didn’t have anything to do with the script. Then it was time for the signing of books, and the taking of pictures. This was a great event, and Diana Gabaldon was amazing! She has a great sense of humor, and a lot of energy (I can’t believe she’s 62!). Chapters Rideau reported that this was their biggest event in the last 5 years. In fact, about 700 people showed up. I, for one, is glad Diana Gabaldon is so popular. She certainly deserves it. Her books are wonderful! PS: I plan to re-read the whole series, and I will review each book on my blog. But please be patient, my to-be-read list is very long! 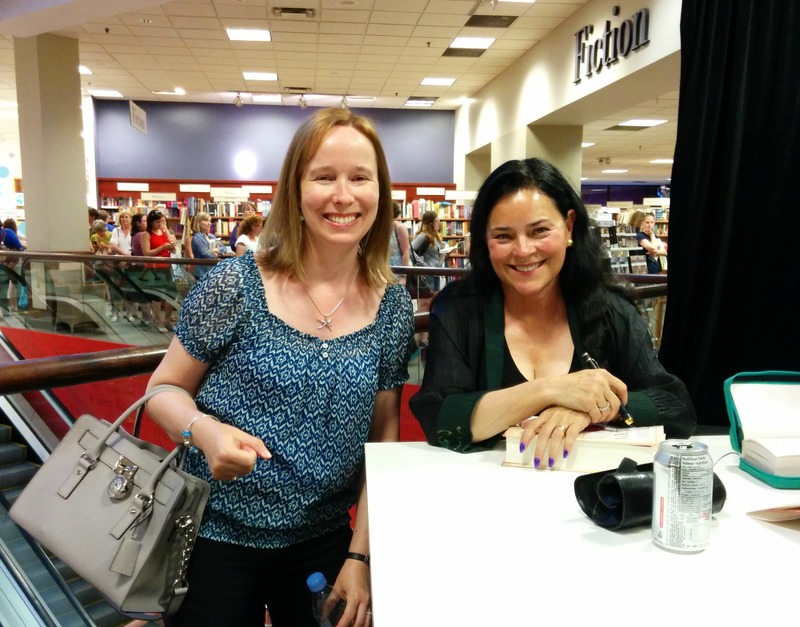 Hi Cecile…( I sat next to you ) at Diana Gabaldon event at Chapters -Rideau St . Ottawa…. Thankyou for your blog commentary on the event, yes, I agree, worth the wait, the choir amazing, and Diana is quite the gal, A feisty 62 yr old indeed 🙂 I was glad to have met her, and will have to get cracking on finishing up reading of BREATH AND ASHES, ECHO and the BONE, and now this latest installment … Yes, you can certainly re-read her stuff time and again. You did a great review here, will come back often ! Thank you, Jacki! It was nice meeting you! OMG, I love her books as well and am so impressed you got to see her in Ottawa. Thanks for sharing the event via your blog. I has no idea Diana Gabbaldon is 62. Amazing. I’m curious to know if that is her real name. Did she say anything about that?